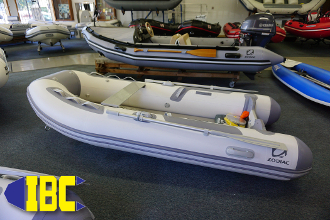 The Zodiac Cadet 310 Aero meets the requirement for lightweight and easy to use tenders! The Zodiac Cadet 310 Aero inflatable boat has what you need whether you are looking for a nice sized dinghy or a portable boat for the entire family to enjoy without stepping up to the Zodiac 325 Fastroller. The inflatable floor system and deeper inflatable keel ensure good performance and robustness that you can rely on. Quickly becoming "THEE" low cost dinghy to have in sailng and power boating circles Worldwide. 44" X 27" X 12"